“Identity politics” is a phrase we see a lot these days. There isn’t a week that passes where one cannot read an article, see a social media post or view a news clip, damning the concept and proclaiming it as the source of one sort of political evil or another. Both sides of the political spectrum point their finger at the other, proclaiming blind loyalty to their political identity. As corrupt as we believe identity politics to be, we are committed to our own corner of it, with faith that we alone are on the right path, and our values sound and incorruptible. The truth in that belief is only revealed when we, as individuals, are faced with the possibility of our small corners of the world falling to pieces. 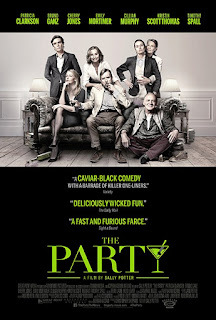 Writer/director Sally Potter’s latest film, The Party, is a study of the concepts of identity and political identity, when faced with adversity. The film begins with Janet (Kristen Scott Thomas) in the kitchen, preparing for a dinner party she is throwing to celebrate her recent election to a high ranking political position. In the other room sits her husband Bill (Timothy Spall), who despite his role as party host #2, seems disoriented. Their guests include April (Patricia Clarkson) and her husband Gottfried (Bruno Ganz), a post-feminist feminist and guru, respectively, lesbian newlyweds Martha (Cherry Jones) and Jinny (Emily Mortimer), and Tom (Cillian Murphy) who works in finance. Primarily shot in 2 rooms, The Party is dialogue driven, with a pace that quickens at the introduction of every new character. 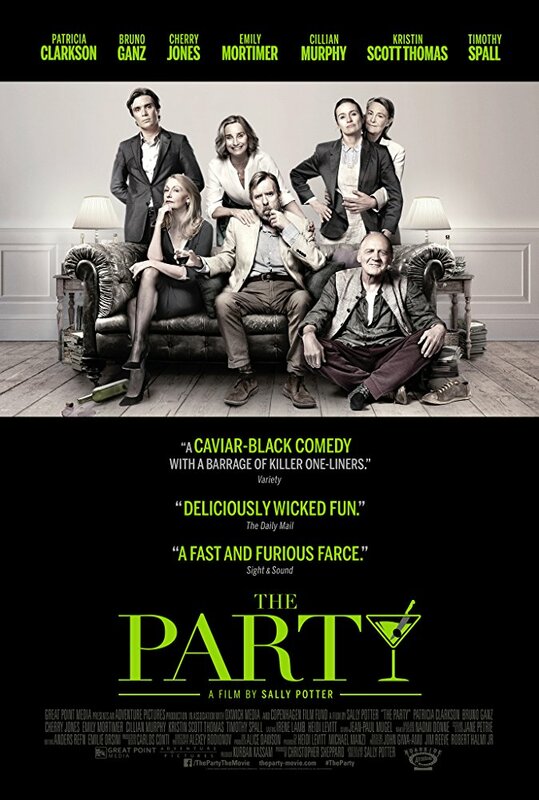 This gives the film an exhilarating intensity, magnified by the viewer’s knowledge that each one of these party guests has a secret, which directly contradicts their identity. Adding to the growing uneasiness, the film is shot in black and white and cinematographer Aleksei Rodionov relies heavily on close-ups with a shallow depth of field. This combination removes all distractions from the scenes, focusing the audience on the emotion of the moment. Timothy Spall’s character Bill says “Yes, yes, and I’m Bill, I think. Well I used to be.” This should be the film’s tagline, as this group of British intellectuals are forced to reevaluate their own values as The Party slowly turns to chaos. Buddhist nun Pema Chödrön wrote, “We think that the point is to pass the test or to overcome the problem, but the truth is that things don't really get solved. They come together and they fall apart.” I feel this quote perfectly captures what is at the heart of the film. The idea that you’ve finally made it to the place you wanted to be, become the person you were aiming to be, only to have it fall apart, is something that every human being has experienced. With a run time of only 1 hour 11 minutes, movie lovers everywhere have no reason not to see this film. It is a shining example that quality filmmaking does not require a massive budget or a special effects team with 25 camera setups. During the Berlin Film Festival, director Sally Potter said about The Party, “It’s kind of an antidote to massive budget films with millions of special effects and stuff, which in the end creates a kind of numbing effect.” I couldn’t agree more.